THE POWER OF THE RIFF makes is return this year with a Los Angeles-based event in November, with two days of performances from a wide range of heavy acts. The event includes the celebration of the twentieth anniversary of both SUNN O))) and Southern Lord Recordings. The first incarnation of THE POWER OF THE RIFF since late 2016, this year's gathering will take place the weekend of November 17th and 18th. THE POWER OF THE RIFF's 2018 festivities will begin on Saturday, November 17th, with a kickoff party at The Echo. 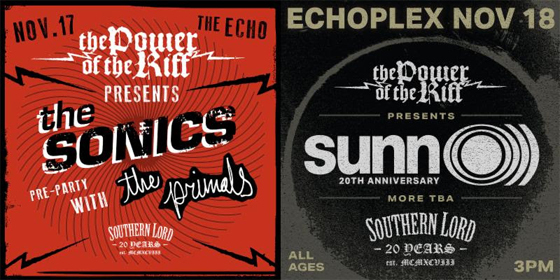 This show will see new Southern Lord act THE PRIMALS, a power trio featuring members of DARKEST HOUR, THE EXPLOSION, and more, opening for a rare set by legendary '60s garage rock outfit, THE SONICS. The main event for THE POWER OF THE RIFF will take place the following day, Sunday, November 18th, at LA's The Echoplex. This show will be headlined by SUNN O))), who in 2018 is celebrating the act's twentieth anniversary along with the Southern Lord label which was also created by the band in 1998. This show mark's SUNN O)))'s only California show of 2018 and final show of the year. Tickets for the even are on sale now at THIS LOCATION. A limited number of special VIP tickets available which include early entry, a drink token, Southern Lord swag bag, a SUNN O))) surprise, and more. Watch for additional acts confirmed to perform at THE POWER OF THE RIFF's 2018 festivities to be announced over the weeks ahead.